PUERTO MALDONADO, Peru (AP) — After lengthy treks through the muddy Amazon, indigenous men, women and children will greet Pope Francis Friday in a visit to the world’s largest rainforest that native leaders hope will mark a turning point for the increasingly threatened ecosystem. Francis is expected to meet with several thousand indigenous people gathering in a coliseum in Puerto Maldonado, the scorching city considered a gateway to the Amazon, in the first full day of the pontiff’s visit to Peru. Indigenous leaders, many sporting headdresses with brightly colored feathers and intricate beaded jewelry, said they are optimistic the pope can serve as a bridge with Peru’s government to help resolve long-standing issues like land rights. Francis’ trip to the Amazon comes as the expansion of illegal gold mining and farming as well as new roads and dams have turned thousands of hectares of once lush green forest into barren, contaminated wasteland. Francis has previously called on world leaders to protect the Amazon, likening it to one of the “lungs of our planet,” and is widely expected to reiterate that message when he speaks in Puerto Maldonado Friday. A meeting with members of Chile’s indigenous Mapuche community was one of the highlights of the first-leg of the pope’s week-long trip to the region. 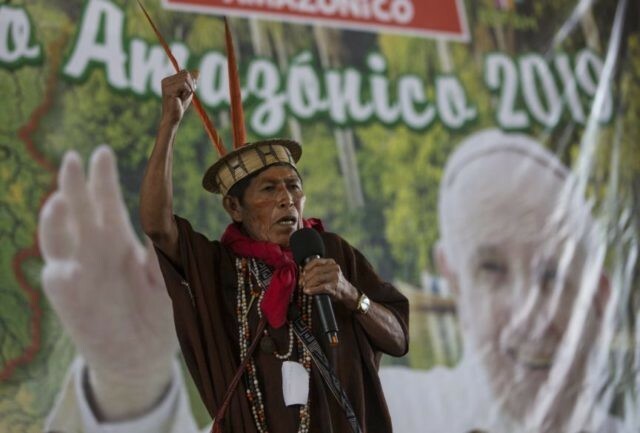 Francis urged Mapuche leaders to refrain from political violence and called on the Chilean government to better engage its indigenous communities. In a letter sent to Francis this week, the leaders of three predominant indigenous groups called on Francis to back their call for the state to grant 20 million hectares in collective land rights to native peoples. They also want him to urge Peru’s government to clean up rivers tainted from illegal gold mining.